Looks promising. I think Respawn will deliver. Eager to see gameplay. Respawn has made my all time favorite PVP game, and I don't like most PVP games, and also the finest single player campaign in a game, I've had the pleasure of playing - Titanfall! The trailer though, looked kinda raw and unfinished and nothing really spoke to me. The wallrunning was an obvious thing from Titanfall though, and they seem to have made a solid Battle Royal game, so I'm pretty hopeful! The EA tweet about how it is single player only, no loot boxes or multiplayer made me laugh. Didn't realise it was the from the makers of Titanfall, makes me more interested than the trailer did. Glad to have Star Wars single player content. I rarely get into Star Wars movies and games. This does look good. Seems to have the grounded feel of Rogue One. Remains to be seen if I click with it but I’m interested. Big props to EA for committing to single player with no micro transactions. Even though I was hoping for something more akin to Star Wars 1313, I'm glad this is being made. Especially if there is truth behind the no loot boxes or microtransactions. I do wonder if it's third or first person however. I do wonder if it's third or first person however. Oooh, I didn’t even consider it would be first person, but considering it's Respawn it very well could be. Overall I prefer first person, but for a melee heavy Jedi game, I think third person would be better. Single-player only, no micro transactions... if the gameplay looks remotely good, I’m tempted to preorder it to make some kind of statement. I can’t remember when I last preordered a game. "Rendered in Unreal Engine. Not actual gameplay footage"
Hmmmm. Some of it clearly rendered. Some bits - the wall running for example - you'd think that's at least a pointer for what they'd be thinking about. I wonder if this will be a spiritual followup to the Jedi Knight series. The pessimist in me thinks it will be more like The Force Unleashed. Don’t get me wrong, I enjoyed those games, but not nearly as much as the Jedi Knight games. I’m wondering if the “hiding” and “being on the run” bits from the trailer imply there will be some stealth elements. I've read third person somewhere --I hope it's true! The reveal trailer didn't really nudge me into a "Must Buy" mentality on the first watch through. Then again, Spider-Man's didn't and it became my game of 2018, so who the hell knows anymore? It makes me wonder why the hell EA gave these guys the go-ahead on the Unreal engine when every other Developer under the EA umbrella says they're forced to use Frostbite? 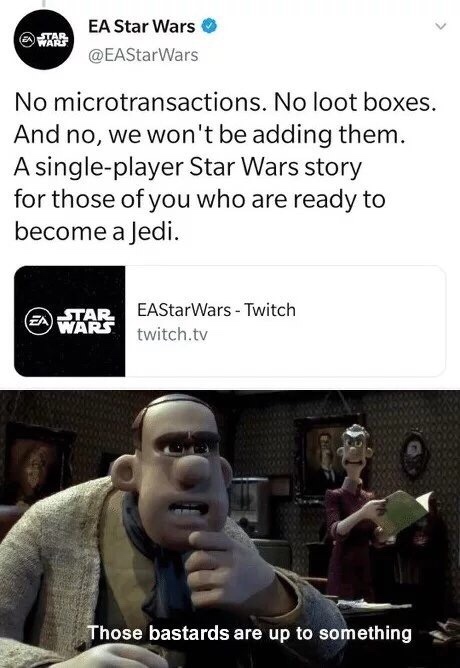 You mean what did they give EA to have the autonomy to do what they want? Their Battle royale game isn't made with Frostbite either. Besides Vince Zampella, Jason West and a sizable chunk of the team that made the Modern Warfare games for Activision? Also, this game was in development for several years before they were acquired by EA. Probably also helped to have Stig Asmussen of God of War as the director of this game. That fits the tone actually. I wouldn't be surprised, now you say, if there was a large or even majority stealth element to the game. Nor was Titanfall 1 & 2. All 3 of those games were made on a heavily modified Source engine. Amazing that it is 15 years old now. Looking forward to seeing what Respawn can do.